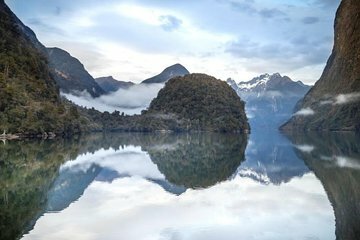 This tour offers stunning scenery but fewer crowds to the more accessible Milford Sound. Your Doubtful Sound cruise begins with hotel pickup in Te Anau for the coach journey to Manapouri Lake. After a brief boat ride over the lake’s vivid waters, you’ll board another bus and cross over 2,198-foot-high (670-meter) Wilmot Pass, stopping to view the Fiordland's dense rainforest and alpine moss gardens with a glimpse of Doubtful Sound in the distance. Continue on to Deep Cove, where you'll board a spacious catamaran for your 3-hour boat tour of Doubtful Sound, part of the World Heritage–listed Fiordland National Park and ten times larger than Milford Sound. Amid this pristine wilderness, whose deep waters are sometimes vivid blue-green and sun-drenched and other times shrouded in mist, you’ll find a rugged landscape of granite peaks and cascading waterfalls. Soak up views of the dramatic topography as your skipper provides insightful commentary and points out South Island wildlife, such as bottlenose dolphins that frequently swim alongside the vessel. Search for rare Fiordland penguins in their natural habitat and New Zealand fur seals often seen basking on the rocks. 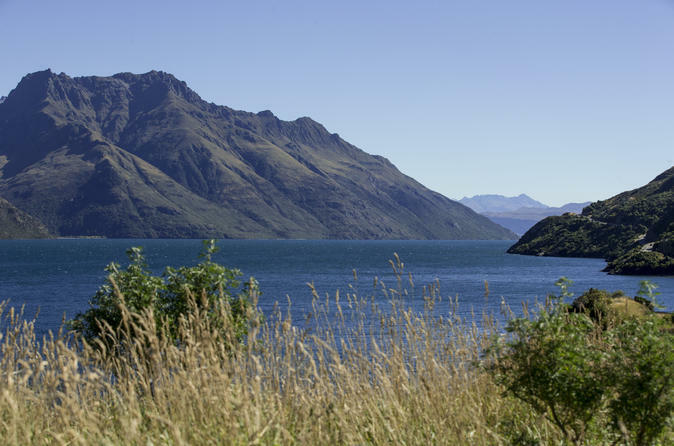 End with the return trip to Manapouri, where you’re transferred back to your Te Anau hotel. Wonderful day trip from Te Anau to Doubtful Sound. Five star organisation from start to finish. Also blest with kind weather for our sail in Doubtful Sound. Real Journeys can be highly recommended for their drivers/ tour guides. Very informative. This was an amazing experience cruising through Doubtful Sound.The operator Real Journeys ran a very slick operation. Nothing was a problem and everything ran to clock work from the time the bus picked up us till we arrived at the boat to take us on the cruise into Doubtful Sound. This was a beautiful day trip. While the weather was wet we still had a very enjoyable day. Staff were capable and helpful, the boat was immaculately clean and well run, and the scenery fabulous. Thank you!! Absolutely stunning and so worth the two bus trips and a lake trip to get to it we were in Te Anau. We were very impressed with the smooth running of the whole day but then, we've never had a Viator trip that hasn't run like clockwork! and loved the final 45minute coach journey, on an unmade road, through the rainforest to get to our boat for the cruise. Entertaining and knowledgable commentary from the drivers/captain on the journey was great. The actual cruise surpassed our expectations stunning scenery with plenty of viewing space for everyone and just enough, sensitive and, at times, hilarious commentary. We were extremely lucky with the wall-to-wall sunshine and even more fortunate to see seals, crested penguins surfing the waves, albatrosses and, best of all, a pod of humpback whales. And the master stroke from the crew...everyone was asked to put away phones/cameras and to stop talking while the engines were cut and we simply drifted along in rapt silence for ten minutes. Bliss. What a marvellous experience. The scenery was like nothing we have ever seen before -breathtaking. The side fjords were magical places and we were also lucky enough to see penguins and a pod of dolphins. Wonderful. The view is great with friendly and informative staffs.